Biggest collection of 25+ best premium WordPress themes specially made for gym, fitness centers, body builders, health centers, yoga, personal trainer, sports center websites. All themes have ultra responsive layout fits well across most kind of device displays and compliance with HTML5 / CSS3 modern web standards. Most of themes designed based on bootstrap framework and compatible with famous WooCommerce WordPress plugin helps you to build your own shopping website in no time. 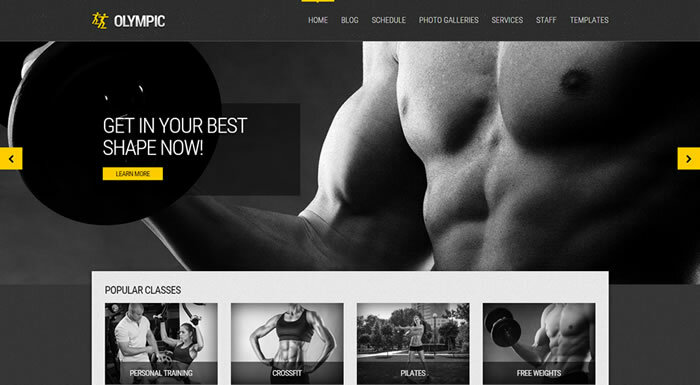 Take a close look on Best gym, fitness, health centers WordPress Themes and find the suitable one for your business. Ulysses is clean and light weight WordPress theme made for gym, fitness, body builders, health and sports center websites loaded with very modern features and design layout. Ulysses is full screen WooCommerce ready one page WordPress theme designed based bootstrap 3 framework. Built to support sticky navigation menu (transparent) and included with various modules, sections for classes and trainers, shortcode elements, blog templates, pricing tables and more. Fitness Zone is muscled with modern technologies and compliance with HTML5 / CSS3 standards. Fitness Zone built using cutting edge technologies and loaded with amazing premium slider WordPress plugin delivers feature rich, eye catching sliders with beautiful transitions and effects. Comes with 5 gorgeous looking home page layouts, 12 built-in colour schemes, full width or boxed layout, Mega menu navigation, 100’s of useful shortcodes, 2 contact page templates and included with BMI calculator which much needed one for fitness related websites. 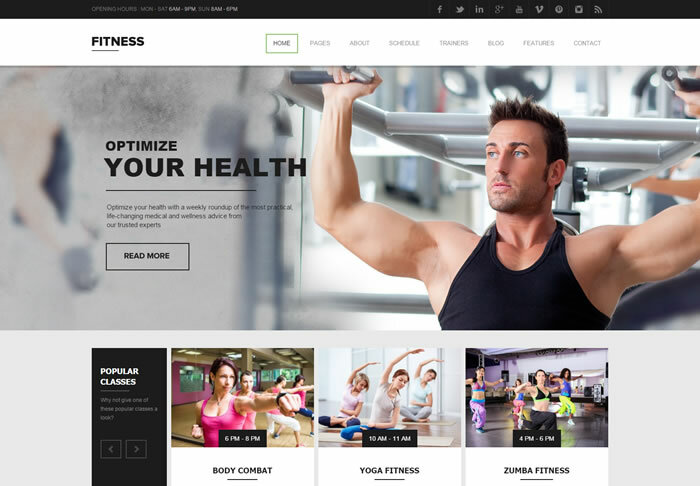 Fitness Zone is 100% responsive, retina ready WordPress theme comes with awesome page builder to create pages and posts are so easier with the help of Visual page builder. Compatible with BuddyPress, bbPress, WPML, Events calender pro plugins as well as WooCommerce shop plugin to sell (or) showcase your products so easily. Fitness Zone theme uses free Google web fonts and pick the best one out of 640 fonts available to choose from. Sports & Life is search engine friendly, cross browser compatible premium WordPress theme designed based on bootstrap 3.1 framework. Its fully responsive, multilingual ready WordPress theme comes with Working contact & email subscription form and extensive theme options panel. Sports & Life has XML demo content to build demo website so easily and its child theme friendly WordPress theme included with Classes / Trainers / Time table / Home page template helps you to easily extend the theme features. Also use your preferred Google web font and assign them to your website via theme options panel super simple interface. Aegon is gorgeous looking multipurpose WordPress theme perfectly fits for fitnesss, gym, body builder and health club websites. Aegon is beautifully designed ultra responsive, retina ready WordPress theme compliance with HTML5 / CSS3 standards and bootstrap 3.2 front end framework. Its one page ready, parallax enabled WordPress theme also support multi page websites. Allows to switch the colour scheme between 4 built-in options and included with tons of modules, shortcodes, Google web fonts, font awesome icons, ajax contact form and also supports unlimited colour options. Using Personal Trainer one page WordPress theme build a beautiful WordPress powered website where you can showcase your personal trainer services, portfolio, classes in a unique way to your clients. Personal Trainer is clean and modern wordpress theme powered by AA team custom framework and enabled to support sticky navigation header, multiple home page sliders, Google web fonts and WPML WordPress plugin will helps you to localize website in preferred languages. Customize the theme without any hassles and you can easily change the theme logo, favicon, colour pallets / schemes, fonts and much more. Its full screen one page WordPress theme bundled with slider revolution ($18) premium WordPress plugin along with layered PSD files as well. In shape is very powerful & feature rich, easily customizable WordPress theme loaded with full screen HTML 5 animated slider. Admin panel is powered by Themefuse framework loaded with easy to use settings and features panel that control the look and feel of entire website with ease. Enabled to support unlimited colours and included with built-in workout calender to include all upcoming training sessions which is unique and handy feature for these kind of websites. Inshape is perfect responsive, retina ready WordPress theme crafted with care to provide an optimal experience and included with various page layouts, sticky navigation menu, highly customizable mega menu navigation, Google web fonts, built-in SEO options, contact form module, unlimited sidebar options, powerful shortcodes, and lot more. 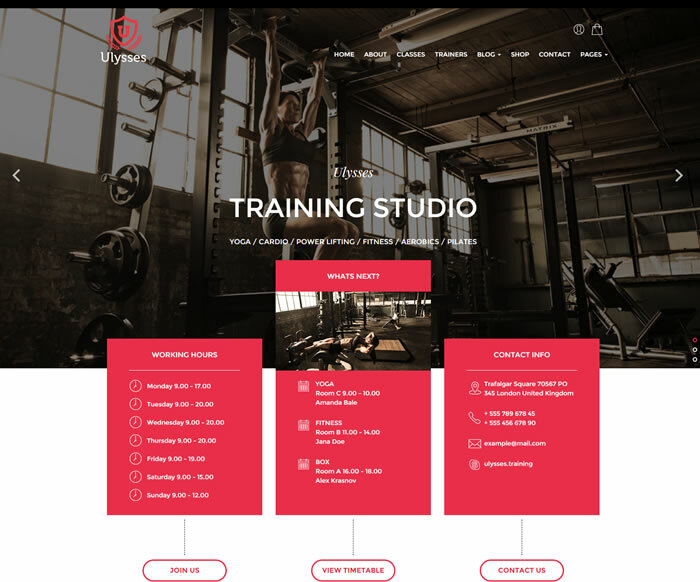 Fitness sports gym is built with 100% responsive layout, retina display ready WordPress theme and its suitable for physical trainers, sports club, fitness centers, personal trainers or any kind of sports activity websites. Fully compatible with WooCommerce shop plugin and integrated with visual composer ($33) drag n drop page builder, slider revolution ($18) with 1200+ premium icon set worth of $39 value. Fitness sport gym responsive WordPress theme had pixel perfect design, its powered by vamtam theme framework supports unlimited colour options, unlimited dynamic sidebars, Full width & boxed layout with 10 header styles. Coded with Valid HTML5/CSS3 standards with minimalistic code structure ensures search engine friendliness. Also supports one page website navigation and available with 10+ portfolio layouts, one click XML demo content helps you to setup demo website in no time. 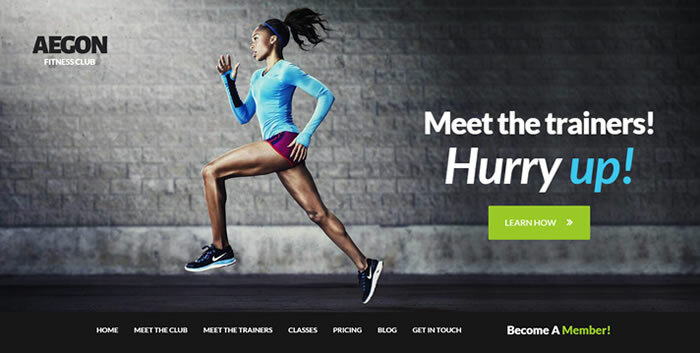 Sportify is outstanding WordPress theme fits well for gym, fitness center and sports related websites and theme powered through Tesla Framework, which is very easy to customize look and feel as well as theme functionalities. Sportify is 100% responsive WordPress theme designed using bootstrap 3 framework and compatible with WooCommerce plugin which very handy and useful to setup online shop in simple steps. Sportify is cross browser compatible, search engine friendly WordPress theme included with 13 posts templates, 9 page templates, ajax contact form and lot more. Bundled with Slider revolution (worth $18) premium WordPress plugin and sportify theme uses web friendly Google web fonts, the most popular web fonts now a days. 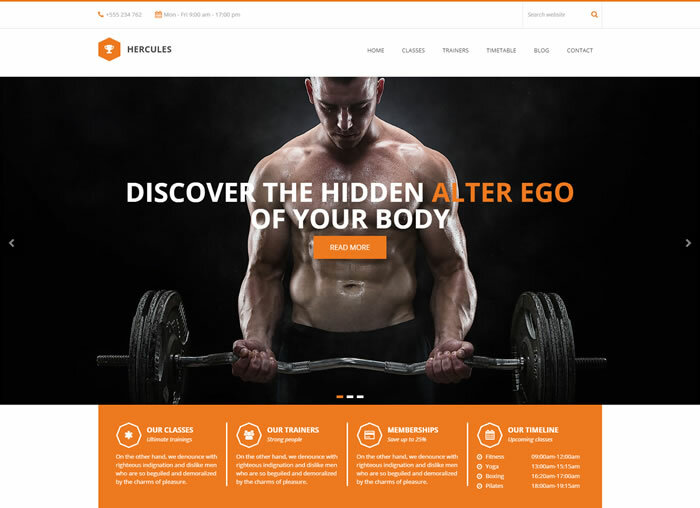 Hercules is an excellent looking responsive, clean and light weight WordPress theme made for gym, fitness centers, sports and training websites. Easily enhanced this theme with One page and multipage versions and it has 100% responsive layout provides optimal viewing experience on different devices such as desktop, laptop, tablet or mobile phone. Compatible with most popular front-end framework for developing responsive, mobile first projects on the web. Hercules is clean coded W3C valid WordPress theme using the latest HTML5 / CSS3 standards and its theme options panel powered by redux framework options panel. Preloaded with classes, testimonial, trainer, timetable custom post types and theme supports infinite colour variations for a better appearance of this theme. Young fitness is very attractive WordPress theme designed and developed using bootstrap framework and compatible WooCommerce shop plugin. Included with 2 home page layouts and 2 portfolio styles suitable for courses and trainer page with ajax technology. Comes with 6 beautiful colour schemes also Young fitness WordPress theme built to support highly customizable mega menu navigation and its theme options panel powered by integrated aqua page builder WordPress plugin. Its SEO optimized, cross browser friendly WordPress theme fully compatible with Nextgen gallery WordPress plugin and theme built to support Google web fonts / Google maps. FitPro is feature rich and fast loading WordPress theme comes with 200+ admin options for extensive customization to customize the theme to your heart’s content and changing colours, backgrounds, layouts, uploading custom logo / favicon are all there. 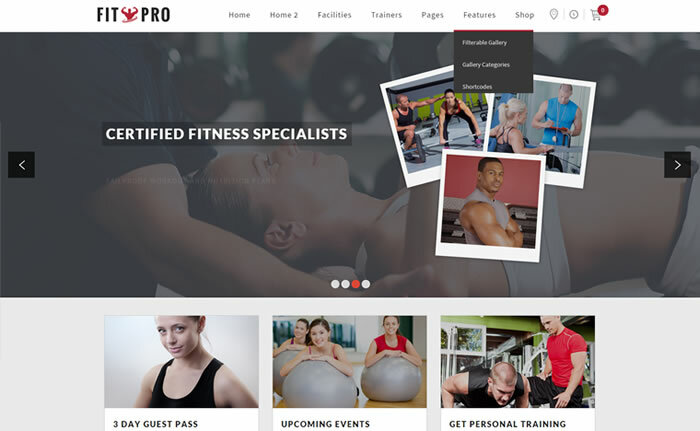 FitPro theme has Flex and Nivo sliders are available to use oh home page template, additionally you can insert flex slider in any post / page with slider with shortcode provided. FitPro is 1180px grid, 12 column WordPress theme bundled with Visual composer ($33) premium WordPress plugin at no extra cost preloaded with 8 very handy custom post types with backend user interface and included with 60+ Shortcodes, 1500+ retina quality icons, 500+ Google web fonts. FitPro theme comes with 12 beautiful skins and able to add custom skin as well. Included with custom background images / patterns, boxed / full width layout able to assign them via theme options panel. 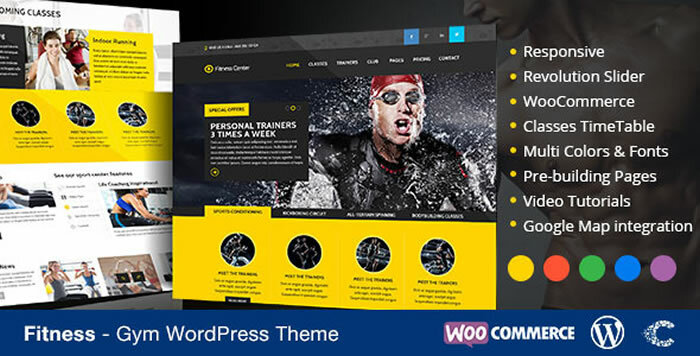 Fitness is WooCommerce ready premium WordPress theme comes with all features / tools fo fulfill the need of Gym, fitness centers ad body building and sport clubs websites. Fitness theme has beautiful hero slider powered through Slider revolution (worth $18) WordPress plugin and bundled the same along with Visual composer ($33) drag n drop page builder WordPress plugin at no extra cost. Fitness is fully responsive, retina ready WordPress theme supports unlimited colours via theme options panel and also set you own colour combination which is best fit for your website. Fitness built with semantic, valid HTML5 / CSS3 standards and its very easily customizable WordPress theme has 7 pre-made color variations, filterable gallery templates also tested and approved with latest WordPress version as well. 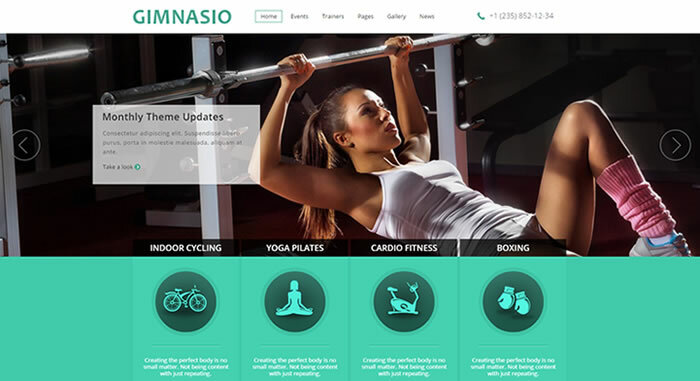 Gimnasio theme has intelligent theme options panel and built with best SEO practises, so everything prepared for your Gym and fitness center businesses and also compatible with famous SEO plugins such as all-in-one SEO, Yoast SEO plugins. 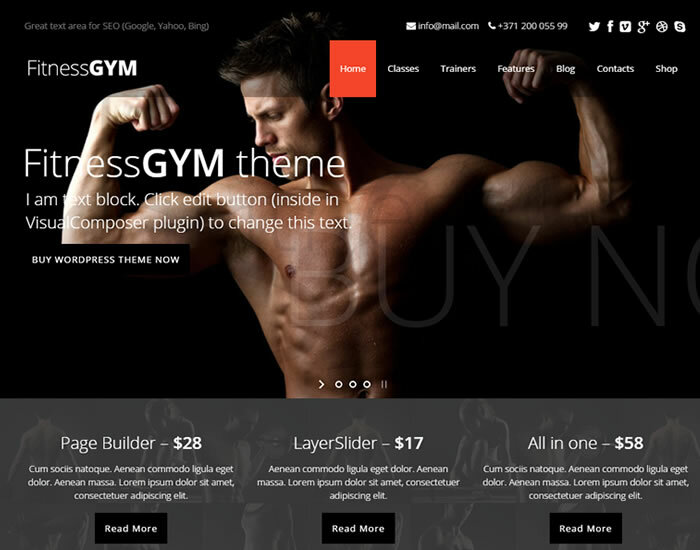 Gimnasio WordPress theme comes with great theme options panel to change skins, colours, fonts, pages templates so easily. Gimnasio is responsive, retina ready WordPress theme compatible with WPML multilingual helps you to localize Gimnasio powered website in your preferred languages & WooCommerce shop plugin is very handy to setup your own shop to show case your products online. Theme shipped with 3 custom post types (Gallery, Events, Trainers) and included with tons of shortcodes, custom widgets, 600+ Google web fonts and lot more. 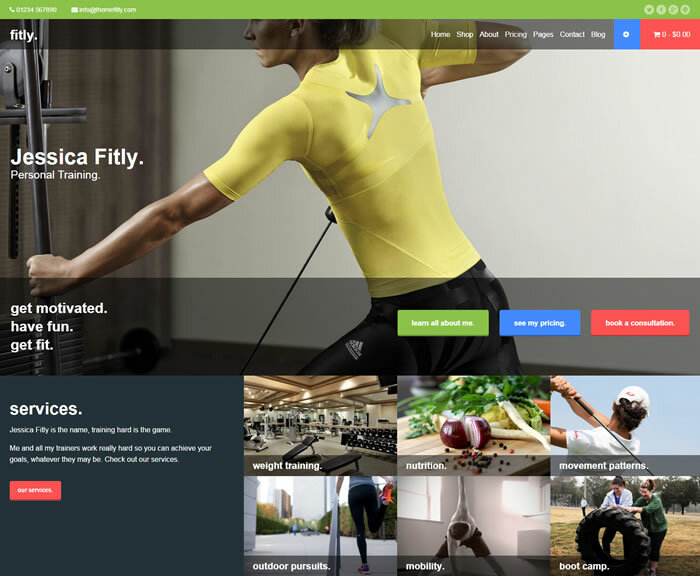 Fitness is clean style premium WordPress theme suits well for health centers, gym, fitness centers websites and theme enabled to support unlimited colour options. Fitness theme packed with plenty of features and bundled with revolution slider (worth $18) premium plugin to handle responsive home page sliders. Fitness is drop down menu enabled WordPress theme shipped with filterable trainers page, custom made icons, 8 custom widgets, class schedule / time table page, handy shortcode elements and lot more. FitnessGYM is clean & flexible super duper premium WordPress theme bundled with Visual composer ($33), Layer slider ($17) premium WordPress plugin at no extra cost and built to support WooCommerce shop plugin. Built-in time table which is an unique feature to create your departments and database of trainers along with their schedules such as days of week, working hours, description or additional tooltip and present everything in a form of time table. FitnessGYM works well with WPML multilingual & qtranslate WordPress plugins to translate your website in your preferred languages, also has extensive admin panel along with 6 post formats, 2 post slider sections, 6 portfolio grid columns templates and bundled with XML file contains demo content. 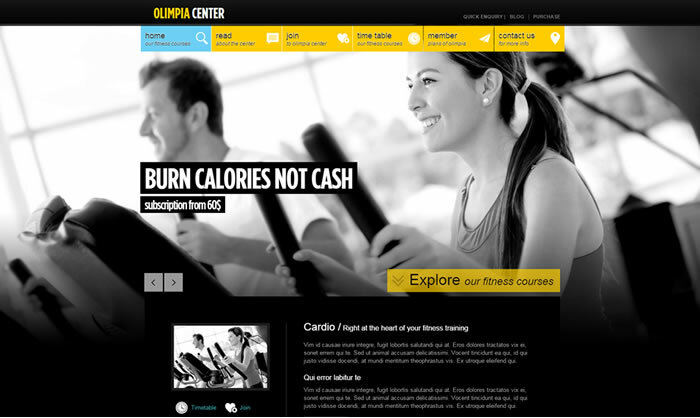 Olimpia is fullscreen WordPress theme suitable for fitness centers, gym, memberships and health club websites. Theme comes with full screen slider along with plenty of features to build powerful website with ease. Olimbia has 5 pre-defined colour schemes, colours can also be changes as desired and included with 3 custom plugins for member plans, services and time table to build specific functionality with these plugins so easily. Olimbia is 100% responsive, retina ready WordPress theme comes with useful shortcodes are very easy to manage to build impressive content in style. 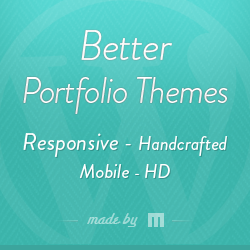 Also has tons of theme options to customize the theme according to your needs and its very easy to use as well. 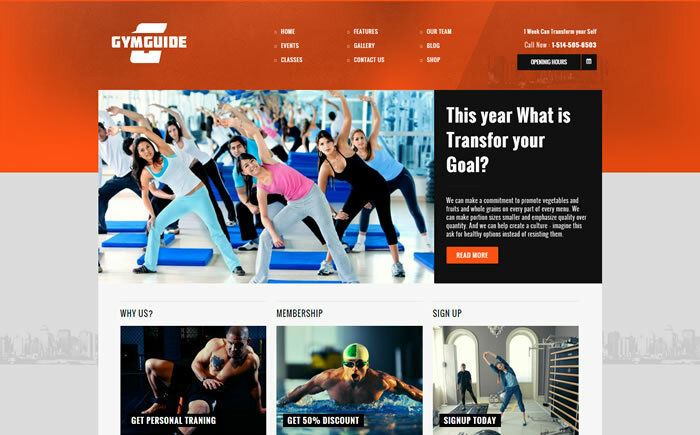 Gym Guide is well made premium WordPress theme built with powerful theme options panel along with fitness classes, Events, slider, sidebar and facilities management custom post types. Gym Guide is cross browser compatible, search engine friendly WordPress theme comes with 8 preloaded color schemes along with drag n drop page builder. Its 100% responsive, retina compliance & WooCommerce compatible WordPress theme designed based on bootstrap 3 mobile first framework built to support WPML multilingual WordPress plugin to localize websites in your preferred languages including RTL languages. 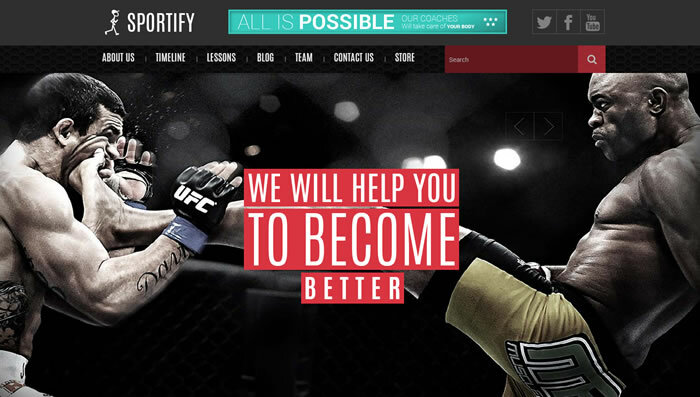 Athlete is ultra responsive & feature rich WordPress theme and its one of the best WordPress theme available online. Its one page / multipage WordPress theme shipped with 7 unique home page versions, multiple header & footer layouts, fitness class / trainer management / events management sections and supports WooCommerce WordPress plugin out of box. Athlete WordPress theme bundled with $150+ worth of premium WordPress plugins including Master Slider ($19), Visual Composer ($33) and Eventon Plugins with addons (Worth $100+) which make athlete theme more powerful and feature rich. With this theme, you can easily create fitness class and trainers with full image gallery and unlimited and editable extra fields. Also comes with one page version helps you to build micro or simple website landing page. Athlete theme provides very easy and comprehensive set of theme options that will helps you to configure and modify the things around your website more easily. Olympic is very flexible & responsive WordPress theme designed using bootstrap 3 framework and olympic theme specially made for Gym, Fitness centers, personal trainers and body builder websites. Olympic is speed optimized WordPress theme preloaded with personal, services, galleries custom post types to handle and demonstrate your business as good as possible. Olympic theme built to support full width header slider (through flex slider jquery plugin), contact form 7, Google web fonts, Google maps, beautiful colour schemes and also included with various post / page templates, custom widgets and many more. 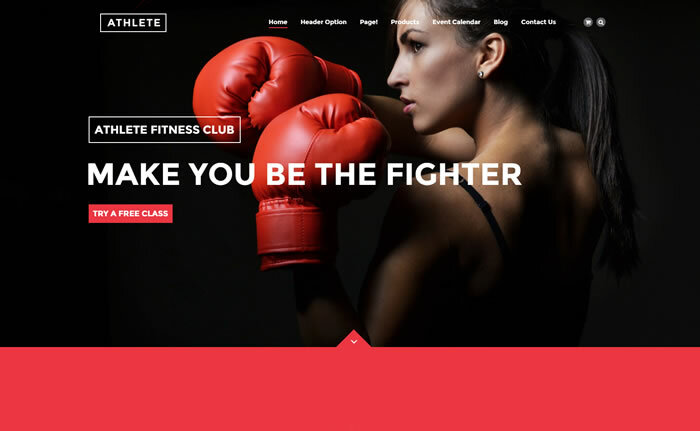 Befit is clean & minimal premium WordPress theme specially made for fitness & personal trainers. Befit is super responsive WordPress theme comes with handy sections to showcase your services, portfolio along with call to action button on home page as well. Befit theme is coded with care, compliance with HTML5/CSS3 standards and tested & approved with latest WordPress version too. Its fully widgetized, cross browser compatible, search engine friendly WordPress theme compatible with famous WordPress plugins such as contact form 7, WP-super cache, W3C total cache, Jet pack and lot more. Bundled with XML demo content, layered PSD template, MySQL file for easy upload of database will initiate to start building your website in no time. 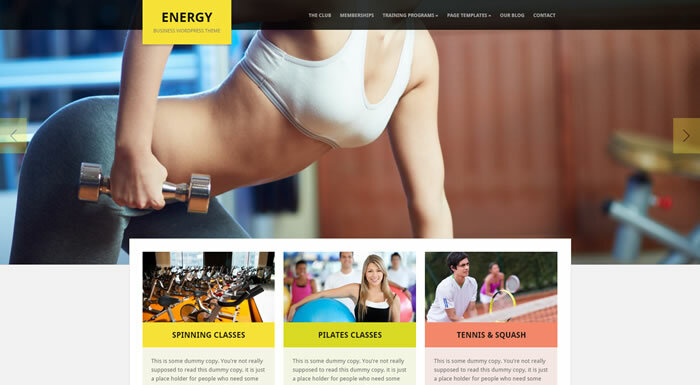 Energy is vibrant looking, modern business WordPress theme which is good model for Gyms, body builders, Fitness centers and sporting venue websites. Comes with catchy hero section handles gorgeous full screen image slider using custom made WZ slider jquery plugin. Energy theme built with HTML5 / CSS3 web standards and included with two beautiful header designs, dynamic home page builder, custom shortcodes, built-in SEO settings and many more. Theme has blog section, custom widgets, pre-built custom post types to manage posts for your website with no mess and Energy theme powered by WPZoom custom made framework. If you found any broken links, don’t forget to notify us using below comment form and share this post via social networking websites such as Facebook, Twitter, Pinterest so on using below share buttons.